Sunday, typically known as the day of rest in most western societies, has been taken to a whole other level in Hong Kong. Since Sunday is the only day that Filipino migrant workers have off they take to public spaces to reconnect with their community. 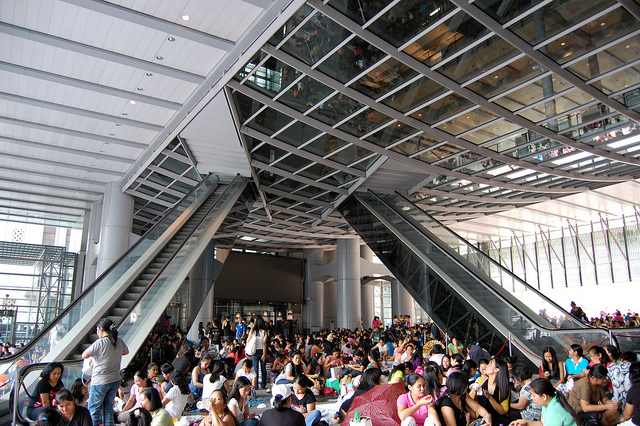 In most cities the conventional idea of public space is plazas, parks, squares, etc but in Hong Kong it has now become corridors within infrastructure and most fascinating the under belly of Norman Foster’s Hong Kong Shanghai Bank. The sheer volume of people occupying the under belly is astounding, the amount of activities endless. The customary blanket has become card board boxes, making the concrete jungle into a brown landscape. The only reminder of the previous hardscape is a sliver of space for circulation. Within this landscape you see the everyday happening; conversations between family and friends, eating, reading, sleeping, preaching, etc. This sensory overload becoming so intense you began to welcome the sound of honking horns as a relief. This phenomenon sparks the question: what do events like these pose to the architect and the creation of public space? First off we should start with what is “public” which has been posed many times throughout this trip. As students, we tend to equate of public space as open aired squares, parks with trees, plazas with cafés. But when you begin to see mass public interaction under one of the most private and high-powered institutions in Hong Kong your preconceptions of public space become skewed. In Aesthetics + Urbanism the articles touch on “what can architects offer to the city?” The opening paragraph stating; “The design of avant-garde works of architecture, influenced by science fiction and digital and aerospace technologies, strains ever toward the future. At the same time, the popular idea of the beautiful city is based on nineteenth-century or even medieval stereotypes. How do we explain this contradiction in aesthetics?” As cities have begun to grow rapidly, especially in China, this question has been pushed to the forefront. The western model of public space is largely focused on plazas, parks etc. This mentality easily accepted with the abundance of land. Yet as China’s population increases dramatically and space becomes limited the notion of public space needs to reevaluated. This is not saying all parks should be scrapped in order to make room for developments but it begs the question can public spaces begin to encroach upon infrastructure? Even more, do we begin to look at built form not just as an envelope where only privatized program takes place but can this envelope begin to open and fold and allow for public interaction within? Both Prix and Stern have merit in their thinking. Though what seem to be contrasting ideas, they are not mutually exclusive. As architects we need to look at the built environment and the problems set before us. You cannot discuss the creation of public space through architecture without first evaluating the context. At the same time that does not mean that every piece of architecture that has form is an object. The best architecture is one that takes these two issues and finds a way to mold them to not only create “unexpected encounters occurring on street corners and sidewalks” but also within the building itself.